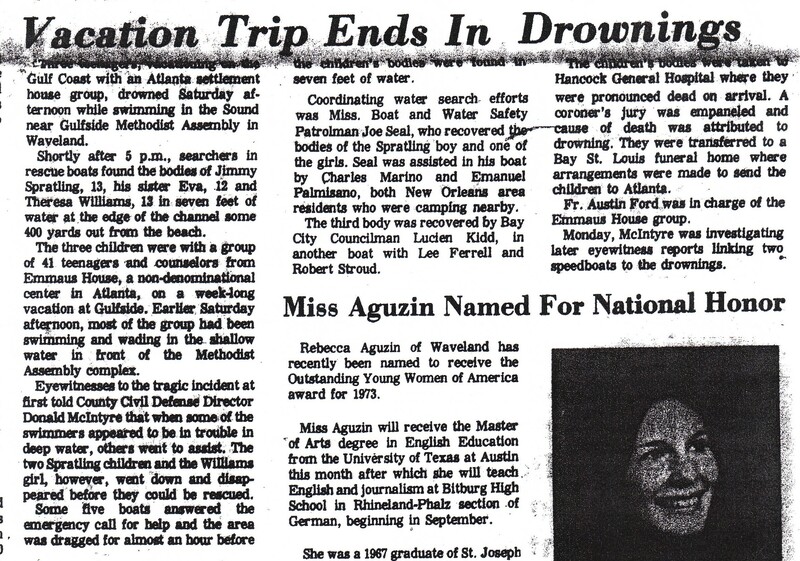 Sun Herald coverage of the Waveland drownings, August 1973. 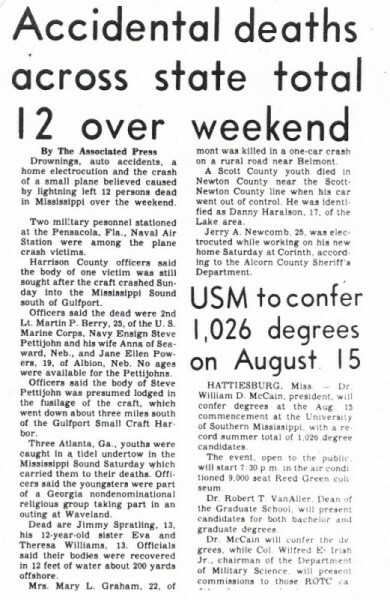 In August 1973, three Peoplestown children drowned while swimming off the coast of Mississippi. Eva Spratling, Jimmy Spratling, and Teresa Williams had been on a trip to New Orleans with Emmaus House to observe the court proceedings related to one of the many school desegregation cases of the period. On the way back to Atlanta, the group of forty or so children and staffers stopped to camp at Gulfside Assembly, an historically black retreat in Waveland, Mississippi that had long served as a refuge and meeting place for civil rights workers. Local authorities spent little time investigating the deaths. As former staff member David Morath explained, “The coroner met the day after the murders and declared it a drowning without any sense of the cause of it. The [Sea Coast Echo] newspaper article went on and on and on about who did what and all this stuff, and the last sentence in it said late reports indicated that boaters may have been involved.” Emmaus House staff then struggled with still-segregated local coroner and mortuary practices before successfully returning the children to their families in Atlanta. This entry was posted in Case Study, Emmaus House, Interpretive Projects, Peoplestown Project Blog. Bookmark the permalink.